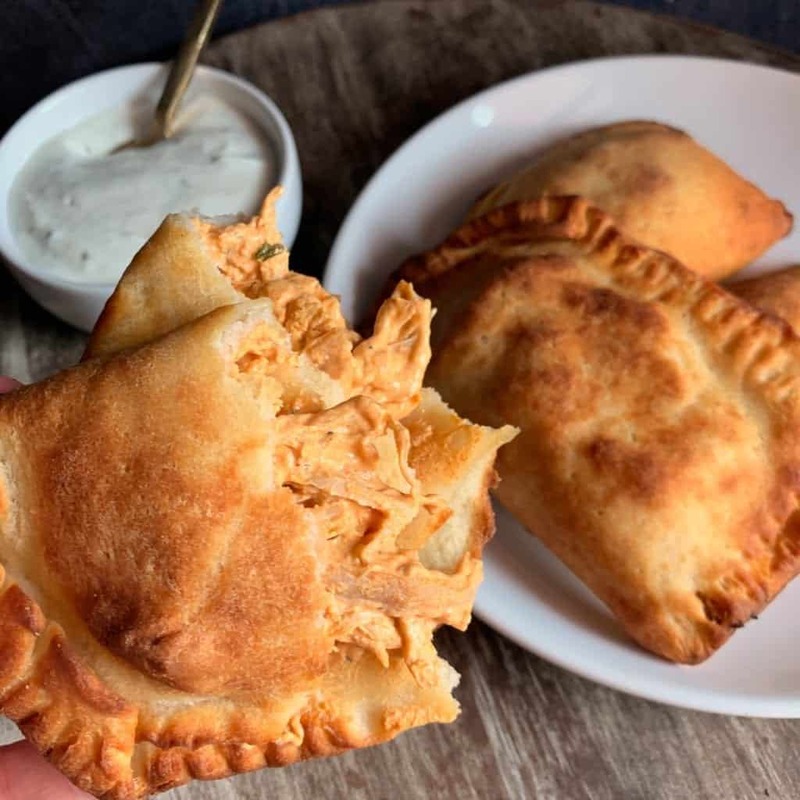 These buffalo chicken empanadas are super easy to make, crunchy on the outside, creamy on the inside, and perfect for the calorie conscious gangsters out there. 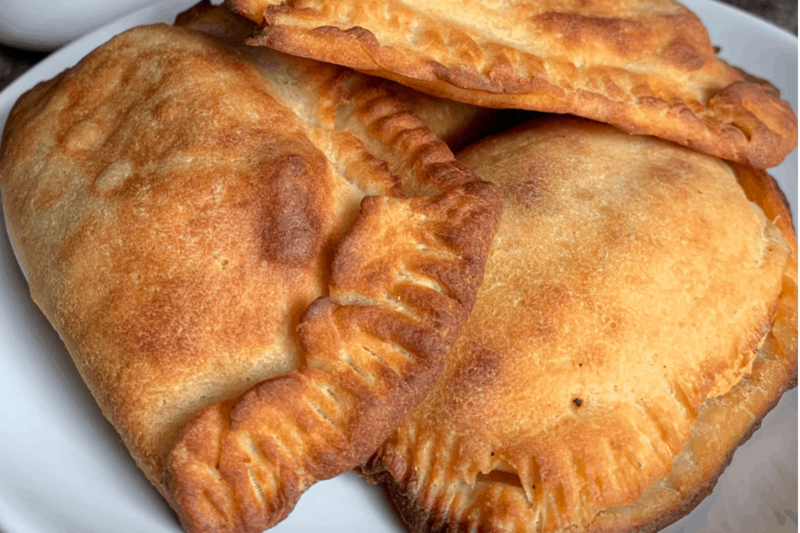 Thanks to a spin on the infamous 2-ingredient dough, each baked empanada has just 4 grams of fat! And best of all, they’re highly customizable. I’ll give you a few of my favorite filling combos below, but you can get as creative as your heart desires. In case you’re unfamiliar with 2-ingredient dough, it’s simply a combination of fat free Greek yogurt and all purpose flour. It’s perfect for bagels, pastries, and especially low calorie pizza. 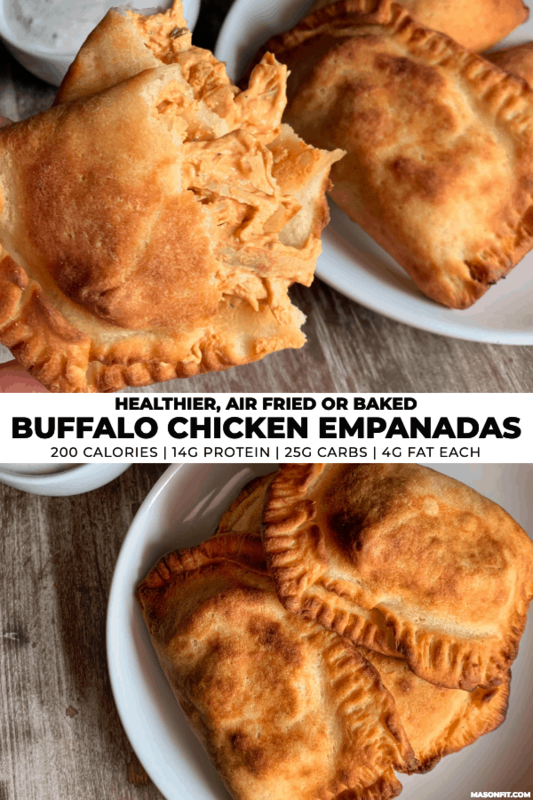 For these baked buffalo chicken empanadas, the recipe calls for blending the dough together in a food processor. But you can certainly mix it by hand like I did in my low calorie pizza recipe. 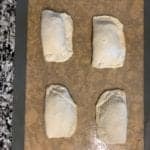 Once you have your dough ready to go, roll it out into rectangle and cut it into 4 pieces. Then it’s as simple as fill, wrap, brush with a bit of oil, and bake! And while it’s not chicken, one final recommendation would be my crispy carnitas. For a quick and easy dip, you can mix 1/2 cup of Greek yogurt with 1 tablespoon of the ranch seasoning. You can also use a premade low calorie ranch, bleu cheese, or dressing of your choice. And if you’re using an air fryer, I fried mine at 400 for 8-10 minutes but cooked the outside a bit too fast. I would reduce the temperature to maybe 375 and fry for 14-16 minutes. And I think that’s about it! 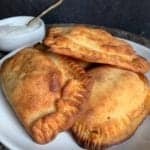 If you make these buffalo chicken empanadas, I wanna see ’em! Grab a photo and tag me on Instagram @mason_woodruff. Or you can join my free Facebook group and share it with the Proton Party. 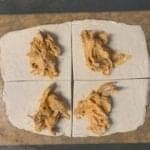 Creamy buffalo chicken inside crispy 2-ingredient dough. Preheat oven to 400F and line a baking sheet with parchment paper or a nonstick mat. 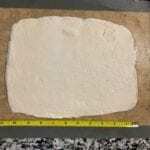 Spray the parchment paper with a bit of cooking spray and roll the dough into a large rectangle (about 11x8). 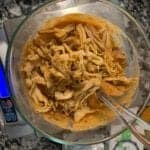 Mix the cream cheese, cooked chicken, buffalo sauce, and ranch seasoning together in a small bowl. Cut the dough into 4 equal pieces and add 1/4th of the buffalo chicken mixture to each piece near the center cut line. Fold the other half of the dough over, sealing the edges all the way around. 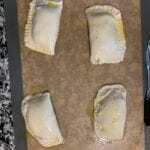 Use a fork to crimp the edges to further seal the empanadas and brush the olive oil over each empanada. If you have trouble rolling your dough because it's too sticky, add a bit more flour. You shouldn't need more than an extra tablespoon or two. I made these last night and they were delicious. I folded them over and made squares instead of Mason’s cute little moon shapes because he’s dough gifted and I am not, but the taste was delicious. 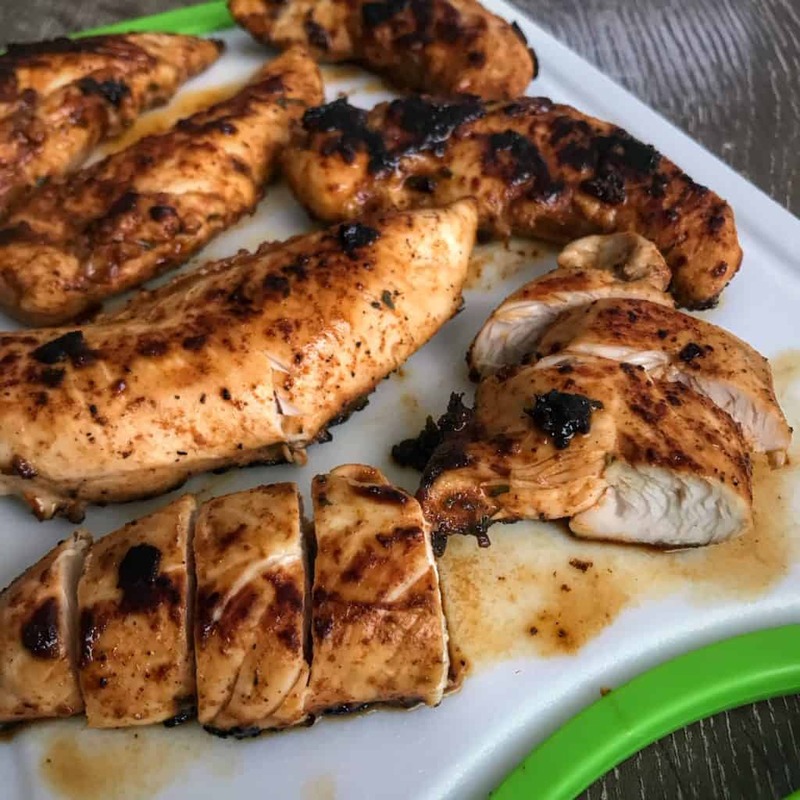 I also increased the chicken to 5 ounces, the cream cheese to 3 ounces and made only 2 servings because I knew I was going to eat two anyway. I highly recommend! I would give these TEN stars if I could, they are a flavor extravaganza! 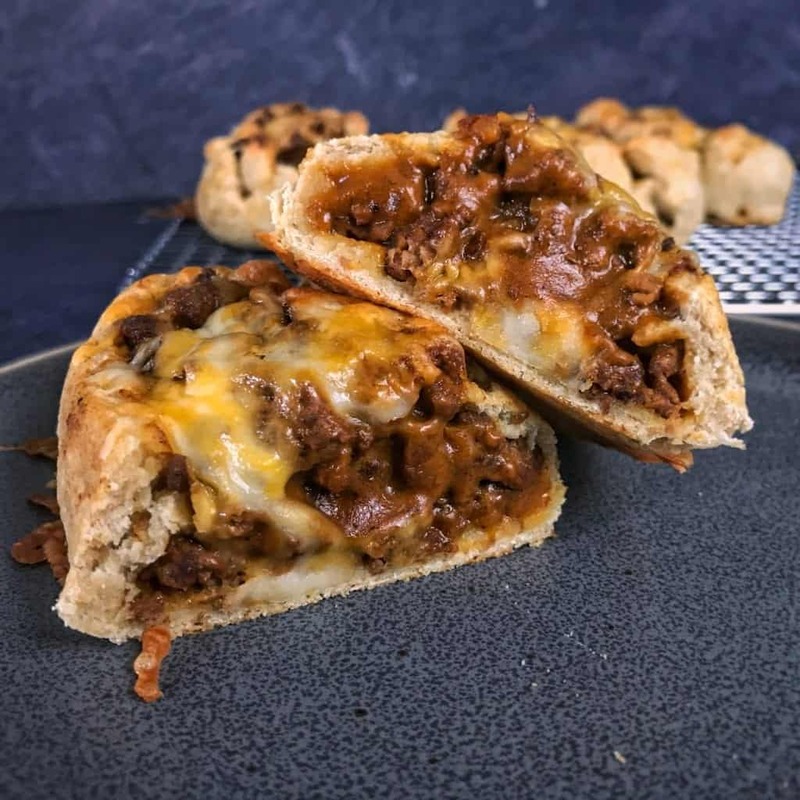 While these require you to break out the rolling pin and are a bit more labor intensive than Mason’s other recipes, don’t let that shy you away…THEY ARE WORTH IT! The customization options are endless with this one if you wanted to change up the spices and/or or protein choices. I tripled the recipe making them for lunches this week, my husband continues to rave about them each day. 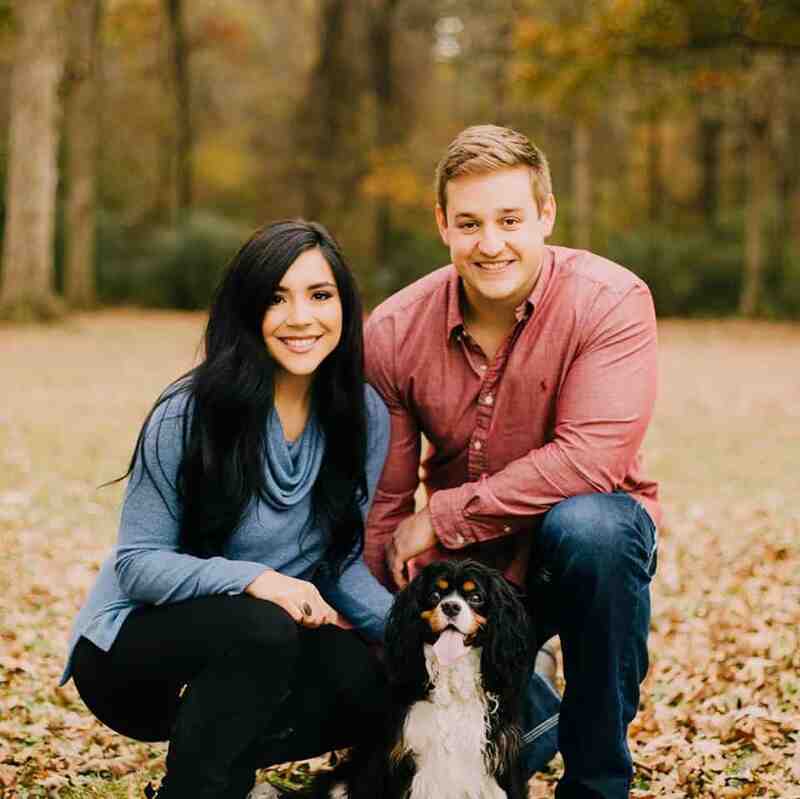 Mason continues to crank out tasty content!